Online shop owners make searches like “How to improve the rank of my eCommerce website” and “How to increase website ranking on Google” because establishing a new online shopping website amongst already established brands is nothing less than a challenge. FATbit SEO professionals knew this when it was approached by MyStore – leading Nigerian online shopping website team for managing its online presence. Made MyStore Google rank organically for almost all the critical keywords. Gave it an enviable position on social media. Made drastic improvements in usability and conversion funnel. Made changes that pushed up sales and revenues. 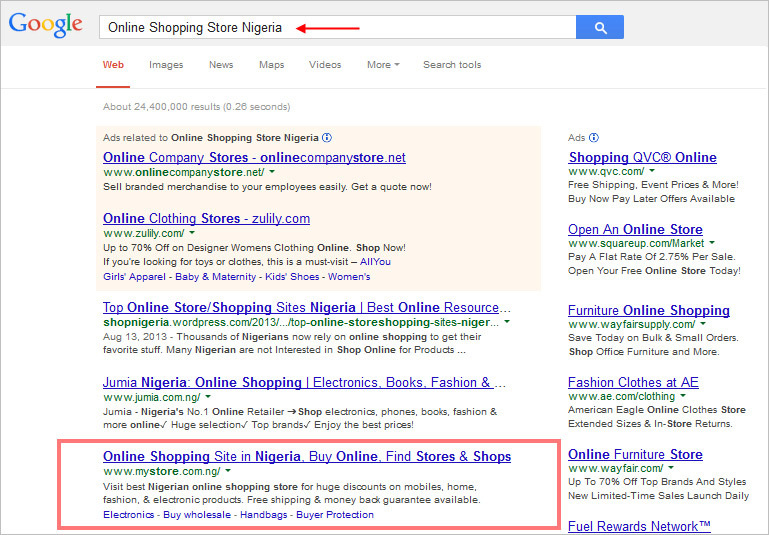 Below is list of steps using which we increased online store ranking by resolving SEO issues with MyStore ecommerce website and made Nigerian shoppers favor it over established online shops. Hope this ecommerce store SEO case study can help you figure out how to improve online store ranking on Google search results. Keyword research is the very first and most critical step for search engine optimization. Lack of quality keyword research is one of the most common issues with ecommerce websites that don’t sell. Using company feedback, AdWords Keyword Planner, Google Auto-complete, and Google Trends, a list of phrases & keywords commonly used as search terms by normal users was created. Does your website rank for the most profitable keywords? Is the website optimized to generate maximum sales? The ecommerce store was custom designed and developed by FATbit and was integrated with an SEO friendly Content Management System. The CMS helped us conveniently optimize website’s loading time, web page size, page titles, meta-tags, URLs, headings, alt tags for images, image & product description, and other various other details for targeted keywords. Our team ensured proper categorization of featured products. If the question, ‘How to increase website ranking on Google’ is occupying your mind, then, on-page optimization could be the answer. Our team brought down website loading time to further improve user experience and in the process managed to reduce website bounce rate as well. High website load time is one of the major issues with online shopping websites due to large number of pages. This helped the online shopping store score in one of the most important search engine ranking factors. Our design team accomplished this by reducing the size of various website components, using better development techniques to fetch data, and deploying faster servers. Working on website loading time is often forgotten by designers and SEO specialists and thus this point is missing from most SEO case studies. 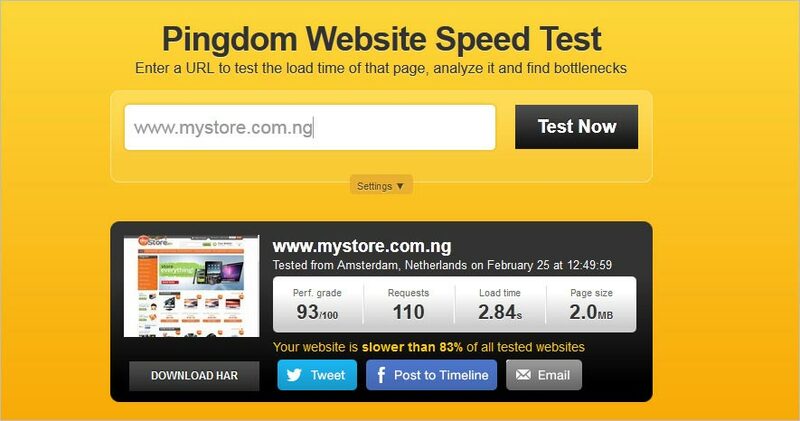 You can use Pingdom, a tool to test website loading time. We advised the category managers of MyStore to add detailed, keyword rich and user friendly product descriptions and update the content on a regular basis. Search engines prefer websites with fresh and quality content. MyStore team was warned against copying content from any other online stores as content duplication is strictly penalized by search engines. FATbit recommends you to improve your online store by paying extra attention to on-site content optimization. 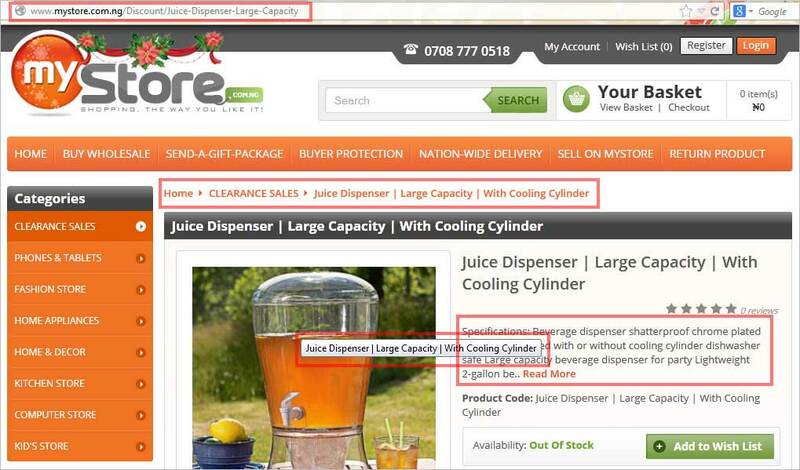 MyStore had duplicate content on some pages as some of the products being sold were very similar. Sometimes, multiple URLs were being generated automatically for the same page every time a new buyer left a review. To counter such issues with the ecommerce site, robots.txt was used. This blocked areas that created duplicate content. Canonical tag was used to indicate web pages to be indexed and no-follow attributes were assigned to links that contained duplicate content. On site SEO takes time to generate returns. So, from the very beginning, FATbit team looked beyond website to generate multiple sources of traffic. Targeting excessive keywords through the official website and getting decent online store ranking for all is not always possible. So, we constantly invested resources towards generating regular traffic through company’s blog, guest blogging, social media marketing, etc. All these external sources were linked to dedicated on-site landing pages for better conversion. If you want to improve your online shopping website sales, then, create as many sources of traffic as possible. If any SEO experts company or their case study claims that excellent results were achieved by just working on the official website- you need to think twice before hiring them. Our team of professional content writers generated quality, informative, and engaging content to share with target audience. Videos, Infographics, Slideshows and various such resources were also created to push as many resources on top 10 search results for targeted keywords. The content was optimized for keywords fwhich affected the online store’s ranking. This helped the brand avoid cannibalization. Content was always created with publishing platform and target audience in mind. Posts were then marketed through social media sharing, participation in discussion forums and comments section. All the external links also helped in link building and improved MyStore’s domain authority. Our SEO team strongly believes that Social Media Optimization is as important as on-site optimization. Various relevant keywords of MyStore were targeted through company’s official and unofficial social media profiles on Facebook, Twitter, Pinterest, Google+, etc. Competitive keywords were used in the profile details, posts, image titles and descriptions, various board details and pins created on Pinterest, etc. Hashtags were used to increase content visibility for both visitors and search engines. MyStore was then tested for usability and visitor user experience. Loopholes in the conversion funnel were identified and corrected to reduce bounce rate. Some corrective steps were taken to increase overall visit duration of the website and they contributed hugely in improving sales for online shopping website. MyStore performance was continuously monitored through Google Analytics and various other tools. Target keywords, homepage, landing pages, external sources of traffic, etc were constantly tracked for fluctuations and areas of improvement. The website’s overall traffic and individual page traffic, visit duration, bounce rate and exit rate, etc were also analyzed. All this helped MyStore in steadily improving its search engine performance as well as presence. Also Read: Your website’s bounce rate can tell you about your lost sales. MyStore is presently growing by leaps and bounds, and is quickly emerging as one of the leading ecommerce stores of Nigeria. Accomplishing the same in such a short time would have been impossible without optimization and website improvement efforts of FATbit team. 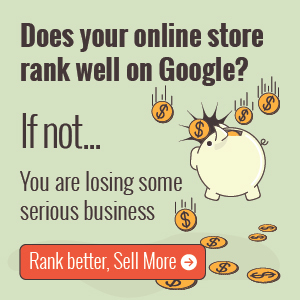 Have you been lately spending your nights wondering ‘why doesn’t my online store ranking increase on Google” and how to improve Google SEO. If yes, then, our ecommerce SEO experts can help you build constant sources of steady traffic and guide you about making small website changes. FATbit can help you drastically improve your sales prospects just like you read in this online ecommerce store’s SEO case study. Request a free consultation session to get your free online store improvement tips. Posted in SEO & PPC, eCommerce and tagged as optimize ecommerce website, improve organic ranking for online store, ecommerce store Google ranking, improve website ranking on google by Amit. It was nice reading the case study. Nice article ! Very comprehensive case study I must say. With the changing face of SEO we need to change our techniques too and seeing the results that you got in such a short span of time I am confident that these rules would work for my store as well. I loved the way this article is written, simple ans easy to understand. Well, these tips are very useful and normal for any new online business, but there are many niches when the competition is so high that we cannot achieve a rank that offers decent traffic without adwords. Thanks for appreciating. Keep coming back for more informative posts. Great post! I’ve been using these tips for my own site since January. My traffic has started to pick up, and I’m hoping it only grows from here. Content marketing, social media and local business listing, will definitely also help in improving google ranking. Category pages optimization will help you to generate huge organic traffic. We recommend you to start focusing on promotion of homepage and category pages for now. nice article bro. finally found a helpful article… thanks for sharing it.. keep writing bro..
Great tips Amit! Thanks for sharing. I was wondering, what keyword search tool/s do you recommend? Remember: Tools always help you to give a right direction but it’s important to collect all the things manually based on your own research. Thank You for sharing your article. This is very informative article to organic results on Google. It is really nice to provide such information and Tips. I Will definitely apply all the tips on my Online Shopping website. We are glad you liked it. keep visiting us for more such info. Great article! Thanks for sharing such good info regarding seo. Wow…Thank you so much for information, your site has very good content. Thanks……..
We have written few more insightful and useful posts on SEO, we are sure that you will like it. I read all of your posts, they are very nice and useful. Thank you so much for sharing this information. Thanks for the appreciation Pushpendra! Great Post! It is very informative and helpful to enhance my knowledge. Keep coming for more posts about SEO and ecommerce industry. Nice post !!! Thanks a lot for sharing the nice informative stuff for how to rank your own E Commerce website.